Another month has come and gone which is hard to believe. March went by so quickly! Since it's over I thought I would share some of my spreads from March. 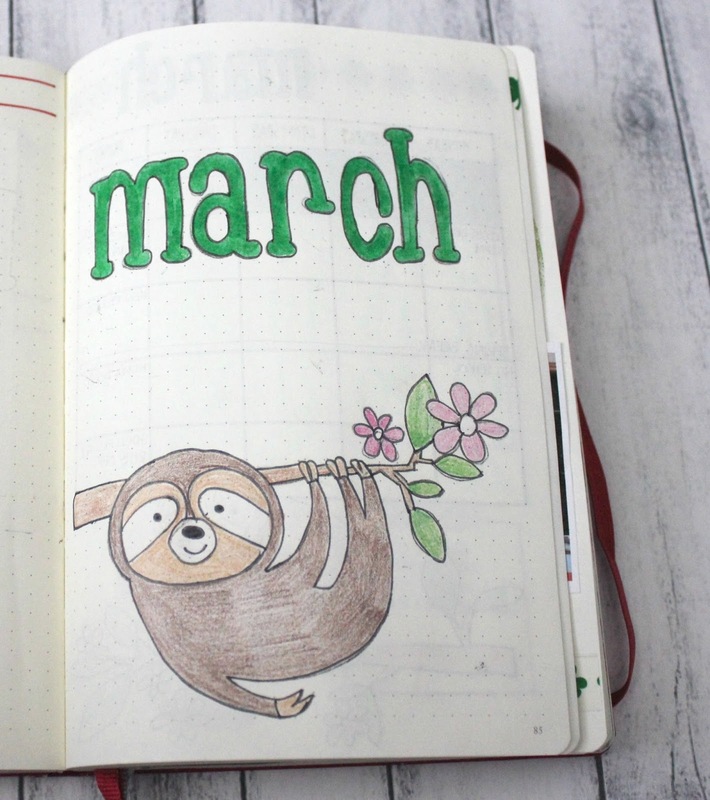 For this month I found these sloths and I couldn't resist. Again I only used tracing paper and a little help with some clipart, but maybe one day I will have the skill to draw my own spreads. But for now it's still just practice. 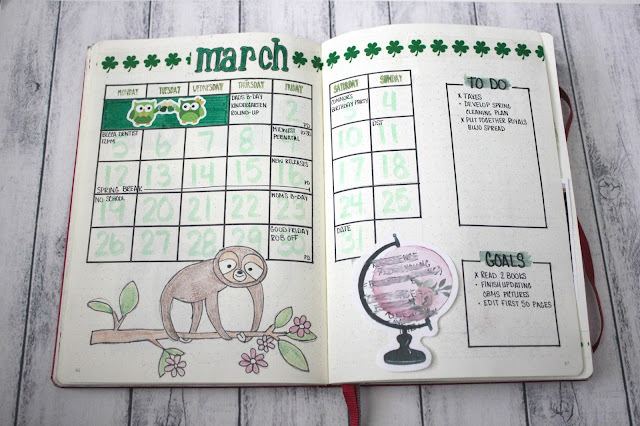 I also went with shades of green for March which probably isn't a huge surprise since St. Patrick's Day is in March and who doesn't the Irish and green?! I did the same calendar, to do, and goals setup that I have done for the previous two months because I just liked how it looked and I felt like it really worked for me. Again tracing paper was used for the sloth and often times I have a sticky note on this page with some kind of information or note from the month that I wanted to remember but had no where to note it. When I first started using the bullet journal I tried using a habit tracker but I just didn't work for me. Now however I am loving it. Of course I do better at some habits than others but it's just makes it something to aim for. It has been much the same with the memories page as well. I used to try to use handlettering and doodles for the memories page but that didn't really work since neither of those things are a strong-suit for me. Instead I have started using pictures, stamping and of course writing to add in. Those are some of my favorite spreads to turn back to. There are all manner of mood trackers out there with most that I see being a mandala. But I didn't like that idea. Instead I use an item that fits the theme of the month and use it that way. I love that it's different each month. 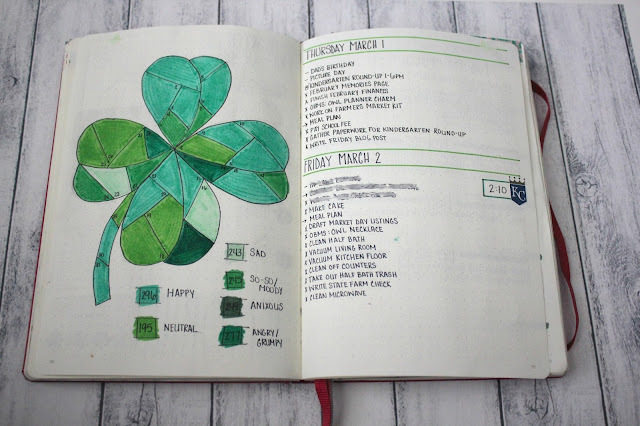 So this month was very clearly a four-leaf clover. And even better, I only had a couple ugh days in there so March turned out to be pretty good. Here is a sample of my dailies. I usually get three-four per page because I'm just not that busy. I have started using some stickers (mostly from Fox & Cactus which are those girls) and I also use a fair amount of stamps. 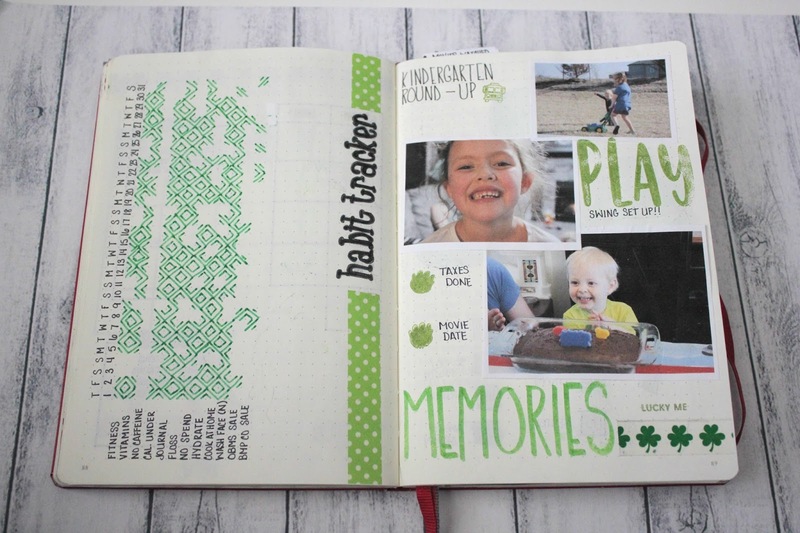 I am loving stamping and adding those into days. It's a pretty simple layout but it works and I like it. I don't use pictures a lot, but sometimes when it goes along with what really happened that day I definitely add it in. On this day I did some stamping, added a picture and the movie ticket, plus a bonus sticker to represent our date we had to the movies. It's simple but fun to later look back on. You can also see my first page of April, which you can probably guess has a yellow theme involving rainy days. I'm already loving this theme being a few days into it now. So that's a recap of March. 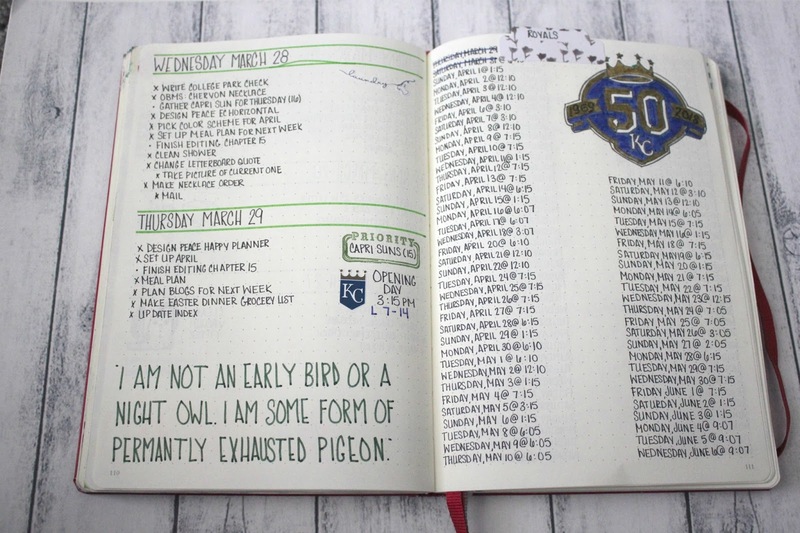 I also want to note that I have stopped doing my meal planning in my bullet journal. I got a second Leuchtturm 1917 in softcover to keep as just a meal planning/grocery shopping notebook. 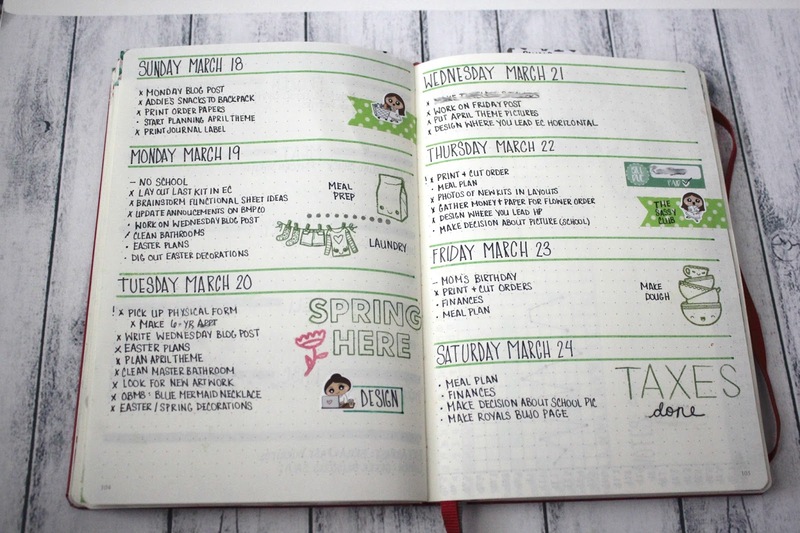 I am also loving having it in a separate notebook so all the weekly meals are together and not taking up so much room in my bullet journal. So that's March and another good month. 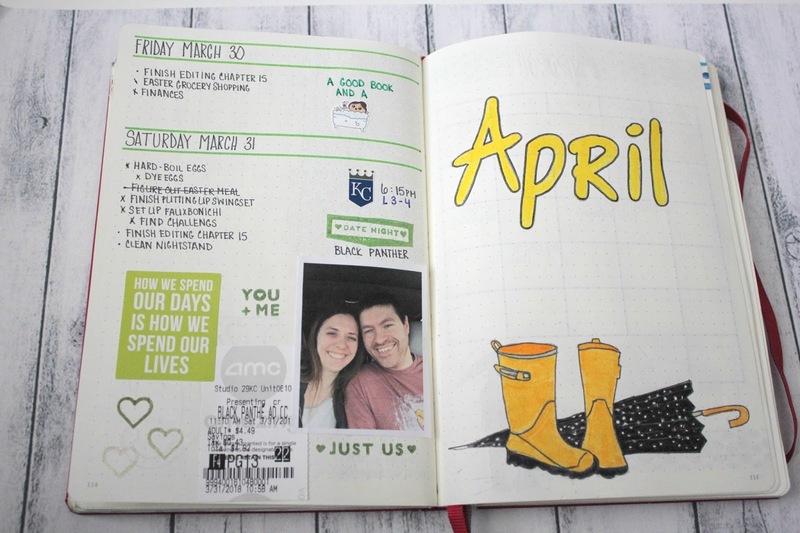 I love how April is coming together and I can't wait to share it next month!